"The problem is solar storms—figuring out how to predict them and stay safe from their effects," says ILWS Chairperson Lika Guhathakurta of NASA headquarters. "We need to make progress on this before the next solar maximum arrives around 2013." 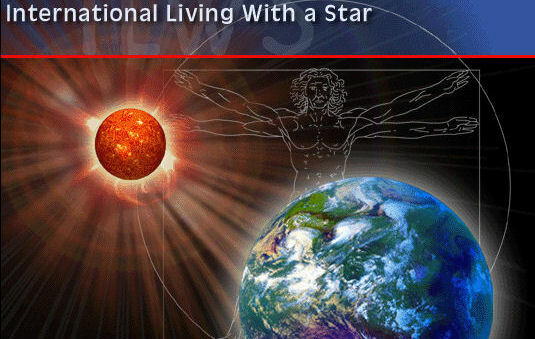 Click on the image to visit the International Living with a Star (ILWS) home page. The sun and Earth are separated by 93 million miles of space—a seemingly safe distance. But since the Space Age began, and especially in recent years, there has been a growing realization that 93 million miles really isn't so far apart. 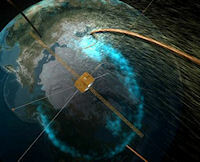 Spacecraft and ground-based observatories have shown that Earth is located in the sun's outer atmosphere, buffeted by solar winds and pelted by hail storms of energetic particles. Moreover, the two bodies are actually connected by invisible threads of magnetism. During "reconnection events," which typically happen several times a day, you can trace invisible lines of force all the way from Earth's poles to the surface of the sun. "The Earth and sun are interconnected. We cannot study them separately anymore," says Guhathakurta. A few years ago, scientists coined the term "heliophysics" to describe the emerging science of the sun-Earth system. As a nod to the importance of the topic, NASA has set up a dedicated Heliophysics Division at HQ in Washington DC, and the United Nations declared 2007 the "International Heliophysical Year" (IHY) in hopes of spurring global involvement in this new field. Predicting solar activity is a complicated problem, akin in some ways to terrestrial weather forecasting but multiplied in difficulty by the thorny physics of solar plasma and magnetism. Predicting the sun is only half the problem, though; the other half is Earth. How our planet's magnetic field and atmosphere respond to any given solar storm is a magnetohydrodynamical riddle that top scientists struggle to understand even with the aid of Earth's most powerful supercomputers. 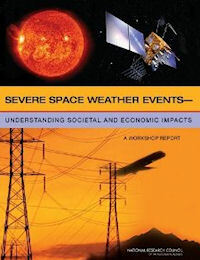 For these reasons, it is often said that space weather forecasting lags 50 years behind its terrestrial counterpart. "We need more data--and more ideas," says Guhathakurta. That's why, this week, she is handing over her chairmanship of ILWS to Dr. Ji Wu of the Chinese Academy of Sciences. In addition to leading the ILWS, Wu will spend the next two years harnessing the special talents of the world's most populous country for heliophysics. "We have many scientists and lots of fresh ideas," says Wu. "China will be able to make important contributions in this area." Another complication is volume. Heliophysics plays out on a stage which is hundreds of millions of miles wide. Simply keeping track of what's going on is a significant challenge. NASA and other space agencies have dozens of spacecraft out there, but they are spread over an enormous volume. "Imagine trying to monitor Earth's oceans with a small number of buoys. You'd miss a lot. That's the situation we're in now with the 'ocean of space,'" says Guhathakurta. China is about to contribute a space-buoy known as "KuaFu," named after a giant in Chinese mythology who wished to capture the sun. Kuafu will be located at the L1 Lagrange point where it will sample the solar wind upstream from Earth. "We're putting KuaFu at a strategic point in space," says Wu. "The solar wind at L1 is an important input to many science models of the sun-Earth interaction." When KuaFu launches it will join a growing international fleet of spacecraft dedicated to heliophysics. NASA, the European Space Agency, the Russian Federal Space Agency, the Canadian Space Agency, JAXA and China are all making significant contributions. If forecasters are correct, the solar cycle will peak during the years around 2013. And while it probably won't be the biggest peak on record, human society has never been more vulnerable. The basics of daily life—from communications to weather forecasting to financial services—depend on satellites and high-tech electronics. A 2008 report by the National Academy of Sciences warned that a century-class solar storm could cause billions in economic damage. Preparing for a "solar Katrina," launching a new science, harnessing the talents of scientists around the globe: "These are just a few of our goals for this week's meeting," says Guhathakurta. Ambitious? Yes, but in heliophysics thinking big comes with the territory.